Click here to view the cases that are currently going through the Zoning Commission rulemaking process. Check here every Friday for an updated report listing the cases submitted to the Zoning Commission and Board of Zoning Adjustment during the previous week. The DC Office of Zoning (OZ) proudly announces an expansion of its online mapping services with the release of the DCOZ 3D Zoning Map. Click here for this week's Board of Zoning Adjustment meeting and hearing schedule. DCOZ and the Office of the Zoning Administrator (ZA) at the DCRA are separate agencies with different roles in the zoning and premitting processes. Click here to ensure you are contacting the correct agency regarding your inquiry or concern. Click here to view the DC Zoning Map and look up Zone District information for any property. Review Case Records/File, Manage, and Submit in Cases. View the Zoning Regulations of 2016 or 1958. Click here for live webcasts of each ZC and BZA Public Meeting or Hearing. View the Zoning Commission and Board of Zoning Adjustment Hearing and Meeting Calendar. The Interactive Zoning Information System (IZIS) allows online case filing, viewing, processing, and management of ZC and BZA cases. All case types must now be filed using this system. The Zoning Handbook is a comprehensive electronic handbook designed to assist the public in understanding the details of the new Zoning Regulations of 2016. Use the Official Zoning Map of the District of Columbia to look up the zone district designation for any property in the District. 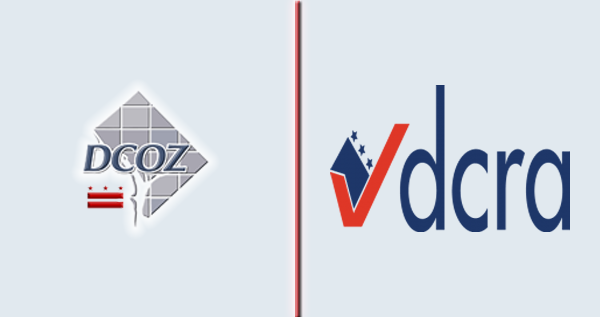 The DC Office of Zoning (DCOZ) and the Office of the Zoning Administrator (ZA) at the Department of Consumer and Regulatory Affairs (DCRA) are separate agencies with different roles in the land use, permitting, and zoning processes in the District of Columbia. In an effort to route you to the correct zoning office, we have provided information below to clarify the functions and services of the DCOZ and the ZA. DCOZ provides administrative, professional, and technical assistance to the Zoning Commission (ZC) and the Board of Zoning Adjustment (BZA) in support of their oversight and adjudication of zoning matters in the District of Columbia. The ZC typically reviews amendments to the Zoning Regulations and the Zoning Map boundaries, while the BZA typically reviews applications for relief from the strict application of the Zoning Regulations on specific properties. DCOZ administers the zoning application processes for the ZC and BZA. The agency reviews and accepts applications, schedules hearings to determine whether cases meet specified zoning criteria, schedules meetings to make determinations with respect to pending applications, and issues legal orders. The Department of Consumer and Regulatory Affairs (DCRA) supports a thriving community of residents, businesses, and visitors through diligent protection of health and safety and equitable administration of regulation and compliance in our District. 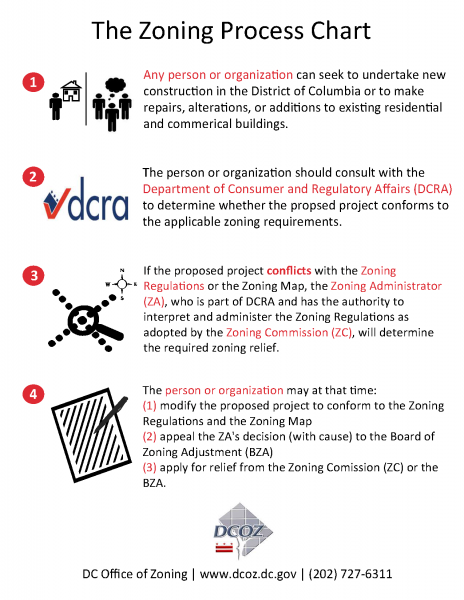 Any person or organization seeking to undertake new construction in the District of Columbia or to make repairs, alterations, or additions to existing buildings should consult with DCRA to determine whether the proposed project conforms to the applicable zoning requirements. DCRA's Office of the Zoning Administrator (ZA) reviews applications for conformity with DC Zoning Regulations (Title 11 DCMR); including building permit applications, Certificate of Occupancy (C of O) applications for allowable uses, occupancy load, verification of address, lot and square, and to determine whether inspections and building plans are required for C of O approval, subdivision applications to ensure that they meet lot size, lot width and other requirements, and Home Occupation Permit (HOP) applications for allowable uses, employee and customer visit limits, and verification of the type of dwelling to be used.